Update: NYPD identified the victim as Martha Tibillin-Guamug, 25, according to the Times Ledger. 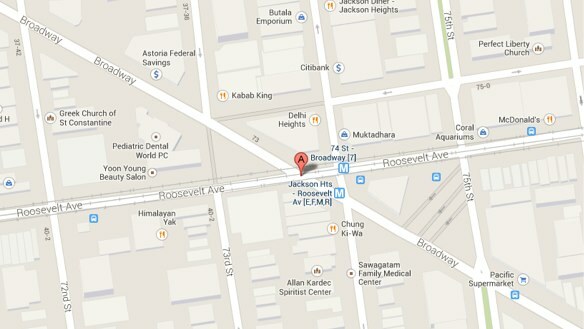 A pedestrian was killed by a Q53 bus driver in Jackson Heights Monday afternoon. Some published reports say the woman was hit near 74th Street and Broadway, but photos of the scene and the Q53 route map indicate that the crash occurred as the bus driver was turning right from Roosevelt Avenue onto Broadway. FDNY got the call at 5:56 p.m. The front window of the bus next to the driver was cracked from the impact and the body of the woman lay under the vehicle near the right front tire a half-hour after the crash. Commuters heading home after work saw the crash and immediately alerted police, but the woman could not be revived, witnesses said. “People started screaming,” Carlos Mesia, 28, who saw the woman hesitate before stepping into the street. He turned away for a moment and heard the bus’s brakes screech. When he turned back, the vehicle rocked like it had just hit a bump. WCBS reported that the victim, whose name has not been released, was crossing Broadway from west to east. If this is correct — again, judging by photos taken at the scene — she would have been in or near the crosswalk, with the bus to her left. 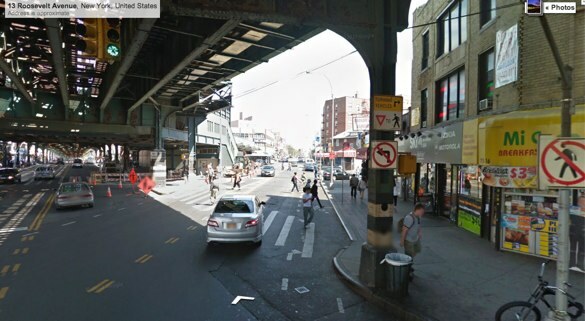 The intersection of Roosevelt Avenue and Broadway is under the elevated 7 track, and there is a stanchion on the southwest corner. On the stanchion is a sign alerting drivers turning right from Roosevelt onto Broadway to yield to pedestrians. Unless there is an exclusive turn phase there, if the driver had a green light, the victim probably also had the signal. This intersection, a short distance from Elmhurst Hospital, has a lot going on, with the elevated train track, streets that meet at odd angles, and poor sight lines. It’s also a major hub for commuters on the 7, E, F, M, and R trains. While DNAinfo for some reason notes that “straphangers often dash into traffic to make their trains,” the only indication we’ve found that the victim was not following traffic rules is an unsourced claim in the Post that she “appeared to be jaywalking.” Based on available information, that scenario seems unlikely. As of this morning, no summonses were issued to the bus driver, according to NYPD. This fatal crash occurred in the City Council district represented by safe streets champion Danny Dromm, and in the 110th Precinct, where at least five other pedestrians have been killed by drivers since last April. To voice your concerns about neighborhood traffic safety directly to Deputy Inspector Ronald D. Leyson, the commanding officer, go to the next precinct community council meeting. The 110th Precinct council meetings happen at 7:00 p.m. on the third Monday of the month at the Flanders Field VFW Post #150, 51-11 108th Street, in Corona. Call the precinct at 718-476-9310 for information. In other words, despite “pedestrian error” “accounting” for only “10% of those collisions,” “4 out of 5” pedestrian fatalities were the fault of the pedestrians. Could someone more skilled in statistics please explain that to the rest of us? You would think that George Kellner would be all over these statistical errors. Where is he? Intersections with els and obtuse angles, like this or Brooklyn’s New Utrecht Avenue seem to “invite” motorists to take turns fast, and “hope” that walkers will respect their ability to kill and “behave”. This intersection is one of the worst in Queens. I got to the site about 30 minutes after it happened. From where the victim was under the bus and where the bus was stopped, yes, it was out of the crosswalk. But how far the bus travelled before it came to a stop is hard to know, hopefully witnesses gave an accurate accounting. Even if it took a second or two, the victim could have been near or in the crosswalk. To add – the streets were a mess last night snow and slush everywhere. Puddles were deep which may have caused her to cross slightly out of the crosswalk. I typically cross blocks from this intersection if I can help it. Typically drivers roar thru it IF they have the light. In reality there is so much going on here – plus double parkers, heaps of pedestrians, the bus & subway terminal, street vendors, and more that no driver should ever go faster than 15 mph when passing thru. And to all that how loud, loud, loud it is under the tracks – it’s a nightmare. 10% of *all collisions* involving pedestrians involve pedestrian error, but 80% of *fatal collisions* involve pedestrian error. That’s mathematically possible. But I think what it really reflects is that dead pedestrians can’t give their side of the story and thus are easier to blame. I used to live right around the corner, at 73rd St and 41st Ave, and I would often just use my unlimited metro card to bypass the surface streets to cross around here — especially to avoid this intersection, which I had to use to do anything east of 74th Street. Even simply to shop at the Pacific Supermarket on B’way at 75th, because crossing Bway was always crappy. This is very, very close to the newish ped plaza on the other side of Roosevelt, and that area is so much better. Yet just steps away we still have this shitshow. Honestly, part of the reason I moved — besides seeking better bicyling at the time — was because traffic was so stressy around there as a pedestrian. Inwood has issues, but nothing like that area. Poor design and high density — it’s just too crowded around there yet people often drive like they are on a highway. Yes. It is amazing what happened to traffic and safety when they put in the ped plaza. SOoooo much better. Hopefully the community thinks about that when they plan solutions. We should take another one of these “diagonals” out of service to make the intersection more sensible. This clearly means that only 20% of pedestrians carry flashlights.